Very smooth, Mister Williams. 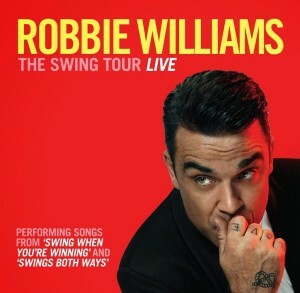 Yes, British popstar Robbie Williams has used his visit to Channel 9’s ‘Today’ program this morning to confirm that he’ll return to our shores later this year for full live shows as part of his ‘Swing Tour’. Chugg Entertainment has locked in dates in Sydney, Melbourne, Brisbane and Perth in the middle of September. And with huge gaps in between each of the shows, there’s plenty of scope to add further concerts if the need arises. The ‘Swing Tour’ is Robbie’s first concert tour of the country in eight years and he’ll be treating audiences to tracks from his latest album ‘Swings Both Ways’ and presumably nuggets from his extensive back catalogue. Visa pre-sale kicks off from 9am local time on February 26, with general public tickets for all shows going live from 10am local time on Tuesday March 04. Unconfirmed at this stage, apparently.